1967 Shelby Cobra till salu - Annons för klassiska bilar från CollectionCar.com. The world of Cobra roadsters is a lot like the world of street rods: there are nice cars and then there are cars that take things to a whole new level. That means Cobra enthusiasts don’t have to look very hard to find a great variety of components and aftermarket support. Unfortunately, the amount of time and money involved in vetting those parts and building a ground-up custom becomes simply mind-boggling. Enthusiasts sometimes spend years writing check after check to shop after shop creating a car that, by the time it’s finished, some of them don’t even want. That’s where your friends at RK Motors Charlotte come in. You can literally walk right in to our showroom and choose the Cobra of your dreams for about half of its assembly cost. And because we actively search for the best cars on the market, you can rest assured that you’re getting a top-notch classic. Decked in vivid 2-stage and supple leather, this impressive roadster pairs a 302 cubic inch Ford V8 with a tough Borg Warner 5-speed and fully custom suspension. Want an over-the-top hot rod that’s a blast to show and even more fun to drive? 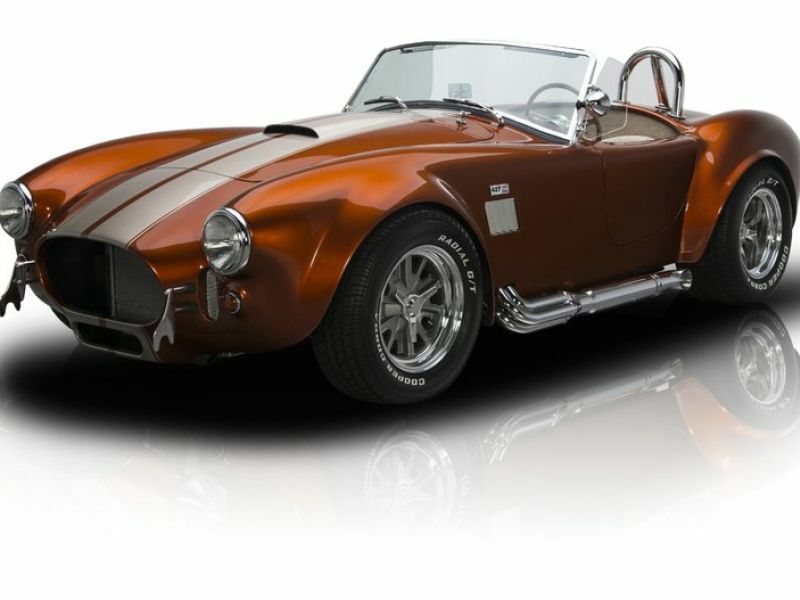 Forget 6-figures and three years of wait time, come claim this cool Copper Cobra! Okay, okay… “Copper” might’ve been a bit of a stretch for the sake of catchy alliteration. But it’s certainly a fair assessment of a color that PPG technically calls Vibrant Nutmeg. 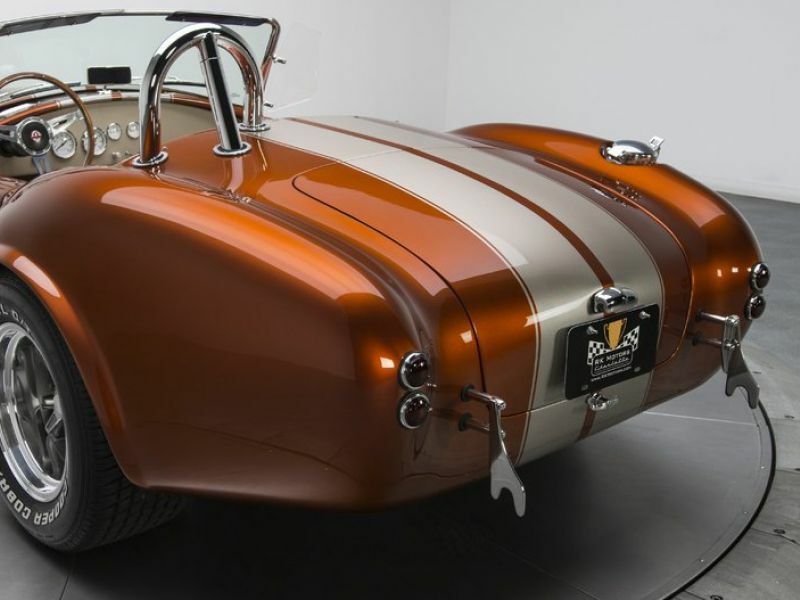 That pigment shines between Pewter racing stripes and a clean fiberglass body that, in the summer of 2015, was completely worked by Cobra expert Bill Jordan. If that name sounds familiar, it’s because Jordan appeared on an episode of South Beach Classics. And if this roadster looks ‘showroom fresh’, it’s because the car has logged less than 100 miles since its completion. At the front of its body, a sculpted nose hangs polished quick lifts and requisite mesh grilles between halogen headlights and chrome-trimmed, bullet-style marker lamps. A sculpted hood anchors an integrated scoop in front of chrome latches. Behind that hood, a chrome-trimmed windshield hangs a small mirror between of clear wind wings, polished wipers and dark-tint visors. At the sides of the car, chrome exhaust pipes frame stylish 427 emblems, aluminum air extractors and a familiar, Monza-style fuel filler. And at the back of the car, a 2-inch stainless roll bar leads the eye to chrome-trimmed taillights, a locking trunk and two more polished quick lifts. ‘Keep it simple’ is a good philosophy when it comes to performance and reliability. 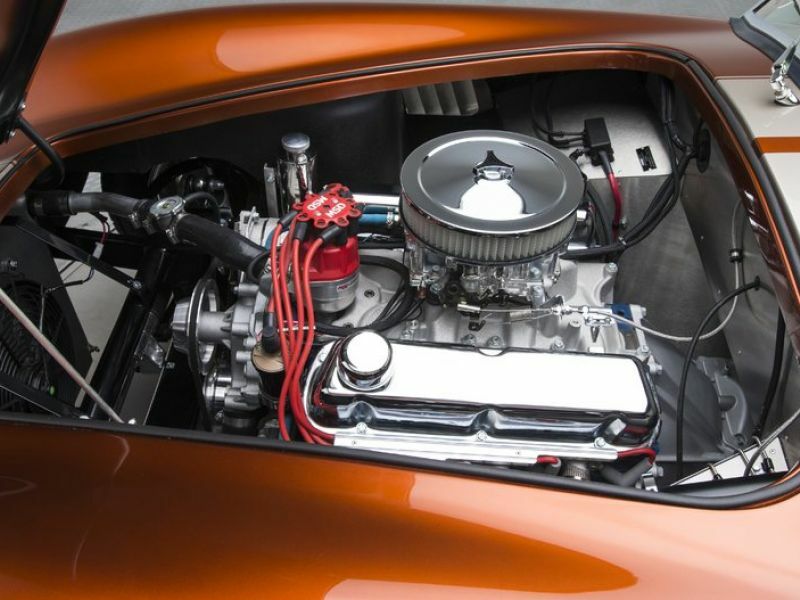 And the builders of this clean classic did exactly that by equipping the car with Ford’s storied, 302 cubic inch small block. At the top of the fully sorted mill, a petite, polished air cleaner funnels oxygen in to a coated Summit carburetor. That juice box rides between polished fuel lines, a clean Summit intake and an MSD Pro-Billet distributor that flames loomed Summit Street & Strip plug wires. That intake pushes air and fossils through factory Ford heads, which balance chrome valve covers under chrome breathers. In front of those covers, billet pulleys spin a fresh aluminum water pump between a Wilson alternator and coated mechanical fuel pump. At the front of those ancillaries, a heavy-duty puller fan cools an aluminum, high capacity radiator. And speaking of keeping things cool, thermal-wrapped headers join an insulated cowl to benefit engine and passengers alike. When it’s time to put your hair in the wind, forget outdated Toploaders because this modern-day Cobra blisters the pavement with a fresh Borg Warner 5-speed. That tough transmission twists a Driveshaft Specialist driveshaft, which spins a 9-inch Ford axle. That drivetrain, bolted to a modern, powder-coated chassis, rolls a high performance independent front and 4-link rear suspension, which benefits from tubular control arms and fully adjustable coil-overs. Authentic track feel is maintained by manual rack-and-pinion steering. Brakes are vented discs at all four corners. And there’s simply nothing that looks better on a Cobra than a set of Halibrand-style wheels, which spin sticky 235/60R15 Cooper Cobra Radial G/Ts in front of aggressive 295/50R15 Cooper Cobra Radial G/Ts. 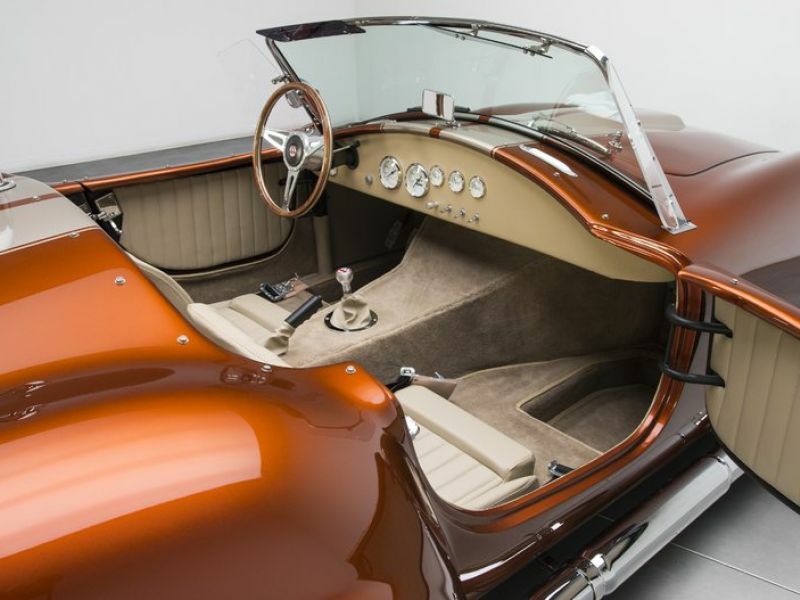 Open the car’s small doors and you’ll find a classy cockpit that’s a bit more luxurious and roomier than typical Cobra fodder. Bomber-style seats wear pleated, stitched and embroidered leather under 4-point safety harnesses. 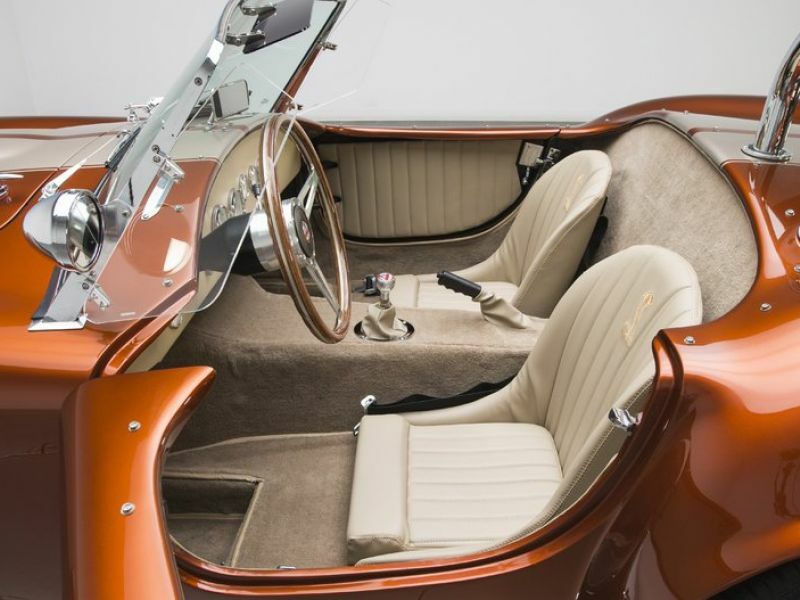 In front of those seats, a painted and upholstered dash founds clean, white-face telemetry under a small rearview mirror. 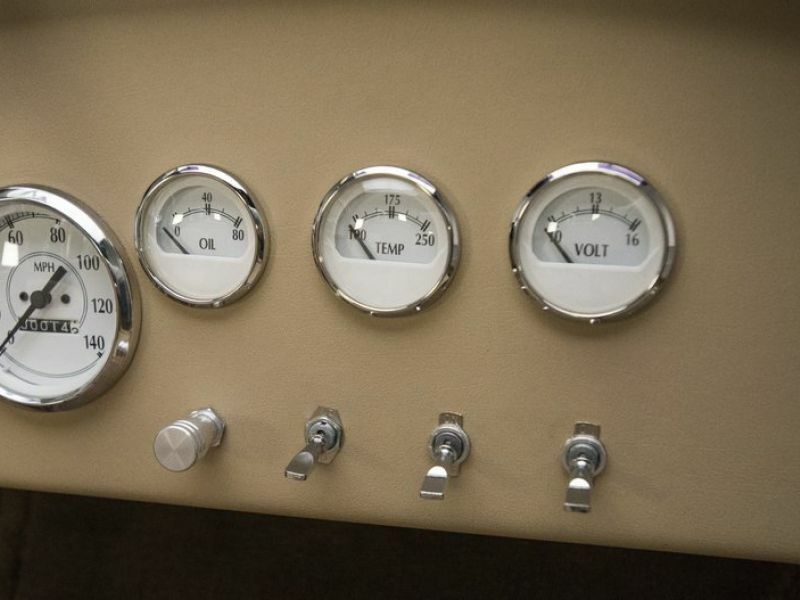 At the sides of that dash, the aforementioned doors hang pleated panels in front of chrome latches. 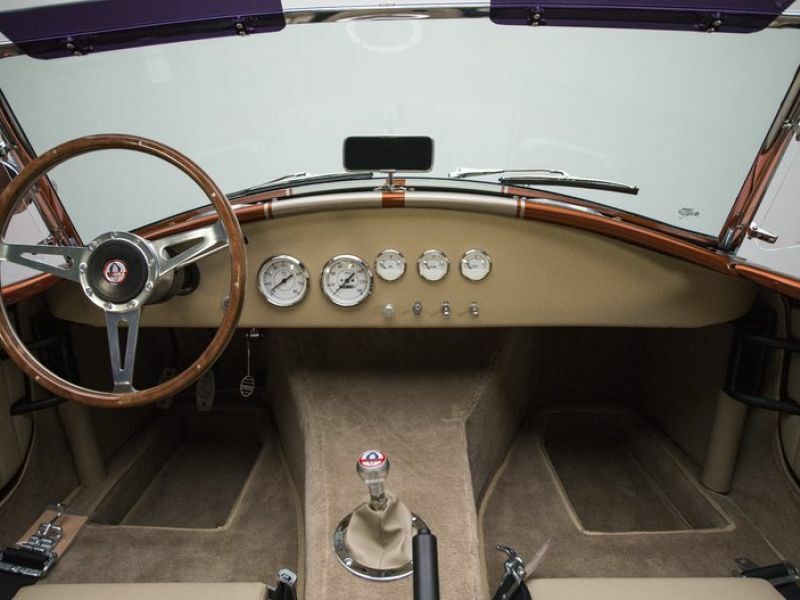 The driver feels the asphalt through metal foot pedals, a small, billet-topped shifter, and a polished and wood-trimmed steering wheel. And the passenger stows cargo in a carpeted and leather-lined trunk. 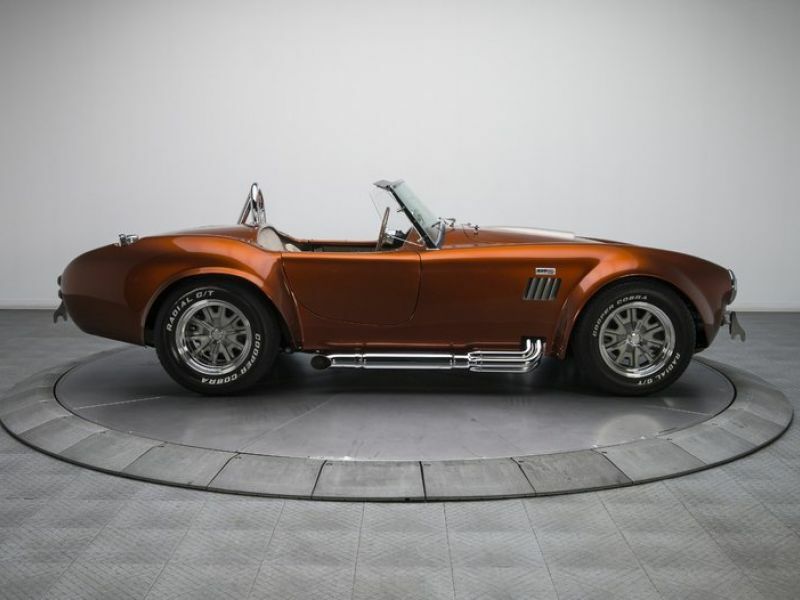 Seductive, carefully assembled and ready to give you the ride of your life, this Cobra is sure to satisfy anyone who has a pulse! Why waste valuable time and money waiting on a custom build when we have an array of top-notch roadsters finished, sorted and ready to roll? Grab the phone, schedule an appointment and drive off with your next classic!